The Kickstarter is up and running and now 24 hours later we have time to sit back for a while and see what happened. We’re pleased to announce that in only one day we have already gotten half of our funding goal! So to you 43 backers who have helped us this far, we cannot thank you enough. But we still have the other half to go, not even to mention all the stretch goals so we need your help, dear reader, to get us that far. Every little bit of funding we get helps, from the largest backer level to even just a dollar, so don’t be intimidated by the higher backing tiers and get scared off, we will be infinitely grateful for any help you can give. Also, help doesn’t just have to come in the form of backing the Kickstarter. What every Kickstarter campaign need most (after funding of course) is exposure. So if you can share the Kickstarter to your social circle and online groups, you are doing us a favour larger than you can imagine. And now for a couple of FAQs. It’s only been a day but we’ve already gotten a few. The first thing a lot of folks want to know is what system Z-Land will be based on, and if they can give it a test or two to see how it works. Well for those of you are curious, Z-Land will be based on the Sigil System, much as The Runed Age, although it will come with a host of unique mechanics focused around survival, social factions and the undead infection. The Sigil System is also available as a free download over on DriveThruRPG, so click the banner below and have a look! A fair question if there ever was one is what we plan to do with the money we raise. The short answer is “Art.” The longer answer has a pretty chart along with it. 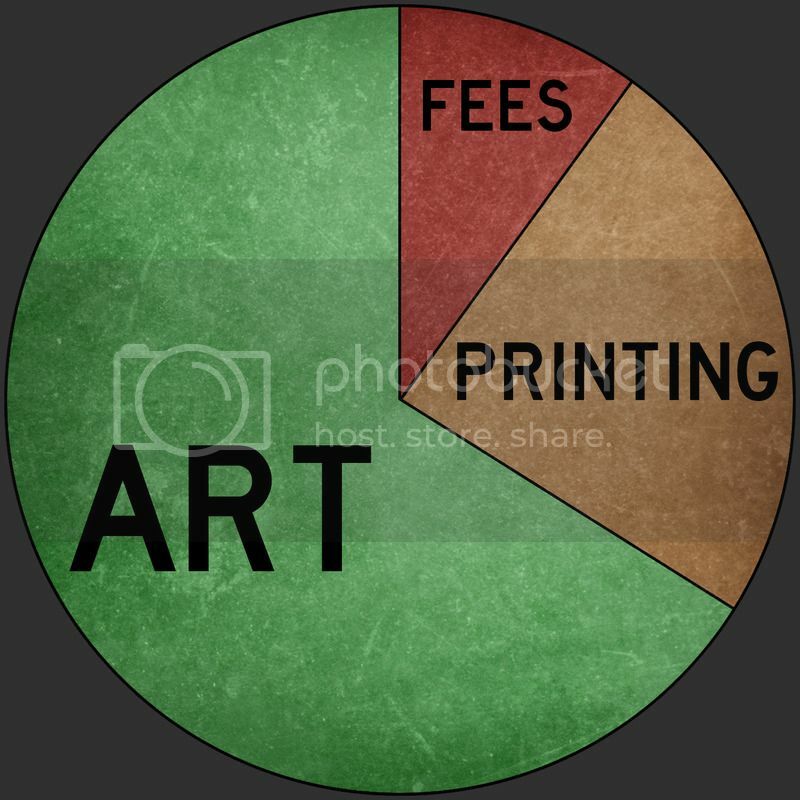 After the fees that Kickstarter takes from the total funding is taken off, we will be spending the money predominantly in two ways: to cover the printing costs at DriveThruRPG for the physical products and all the art we are going to get. We will squirrel away a few pennies to cover editing and proofreading, but the main costs we want to cover and the main reason for the Kickstarter campaign at all is to get money to fund as much art as we can get our hands on to make the Z-Land Corebook look as grand as possible. If you have any questions, comments or critiques, please feel free to drop us an email! We are always happy to help. Yes and yes. We unfortunately don’t have any in-house artists, so all our art for all our products is commissioned. 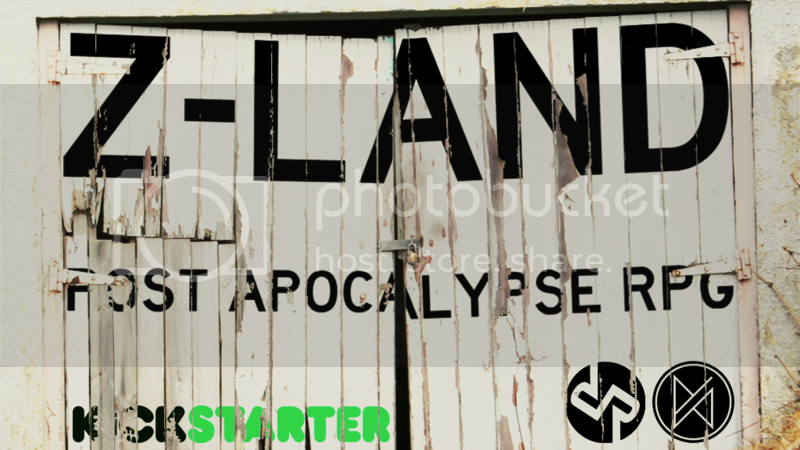 For Z-Land, we want to jam the book with as much art as possible in order to truly give you the feeling of being in the post-apocalypse. We want to show you it, rather than just telling you about it. Previous Previous post: Z-Land Kickstarter is now Live!